I know that when most people think of Valentine's Day that they think of it as a romantic holiday filled with roses and fancy dinners out with your significant other. But Valentine's Day has always been more of a family holiday to me. 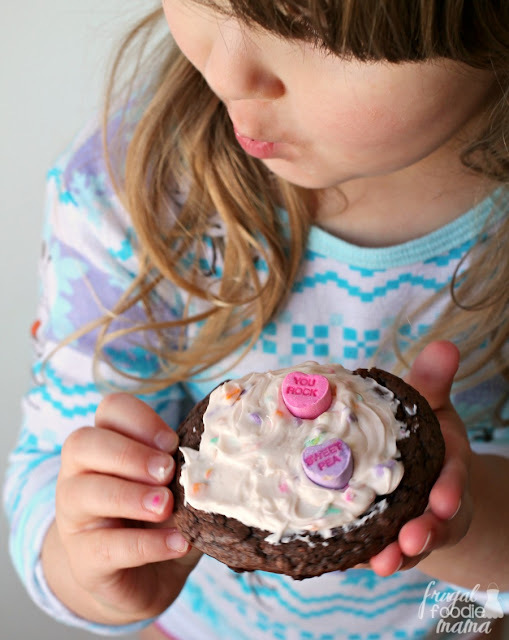 My youngest is now finally old enough to give her mama a helping hand in the kitchen, so this Valentine's Day we decided to whip up some special cookies for our family and her preschool classmates. At first we were thinking brownies, but then she suggested cookies. 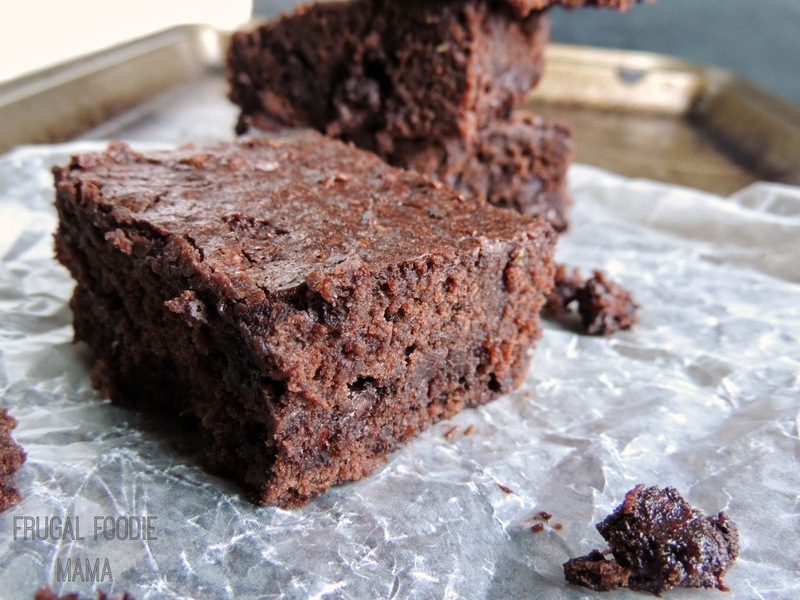 I happened to have a box of our favorite Pillsbury™ Chocolate Fudge Brownie Mix in the pantry, so I thought why couldn't we have both? With just a few simple ingredient tweaks, you can turn your favorite Pillsbury™ boxed brownie mix into fudgy & chewy cookies or what I like to call brookies (Get it? 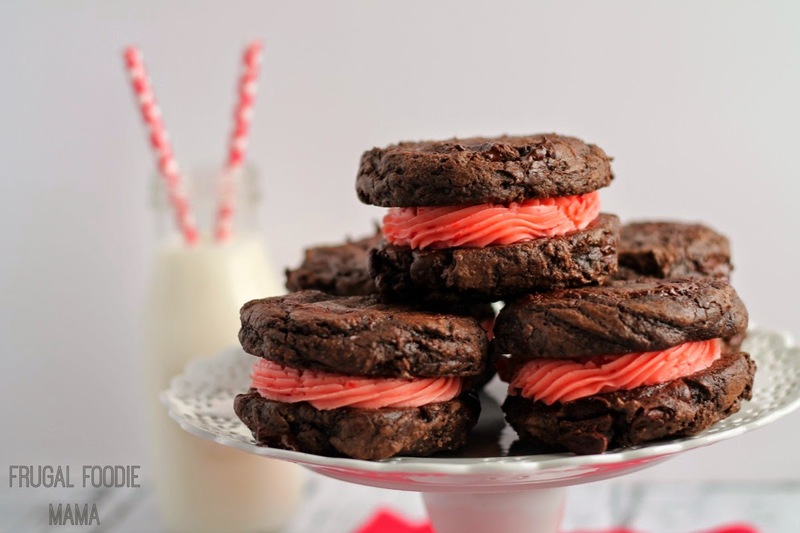 Brownies + cookies = brookies). 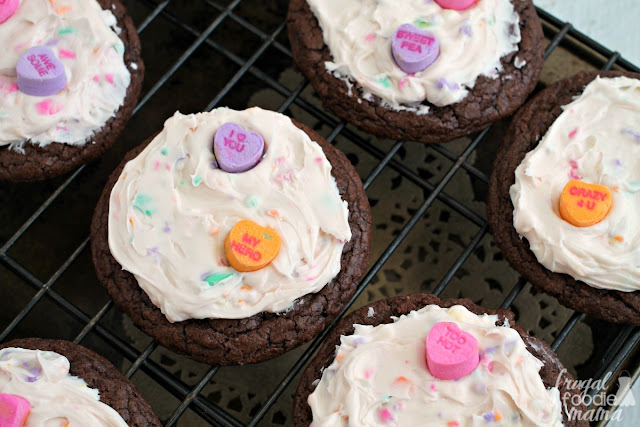 ;) And to make these brookies perfectly festive for the Valentine's Day holiday, we topped them with a simple frosting made from Pillsbury™ Creamy Supreme® Frosting in Vanilla & crushed conversation hearts. I mean, what says Happy Valentine's Day better than pastel colored candy conversation hearts? In a large mixing bowl, stir together the brownie mix, melted shortening, egg, & chocolate syrup until well mixed & evenly moistened. Roll the dough into 1 1/2 inch balls and place at least 2 inches apart on the prepared baking sheet. Bake for 12-14 minutes or until set. Allow to the cookies to cool for a few minutes on the baking sheet before transferring to a wire rack to cool completely. 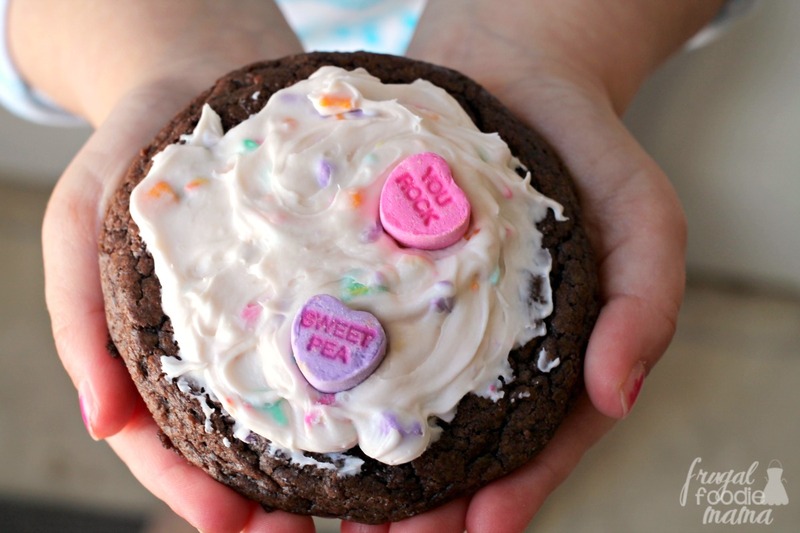 While the brookies are cooling, prepare the conversation heart frosting. Spoon the tub of vanilla frosting into a medium mixing bowl. Fold in the crushed conversation hearts. Once the cookies have cooled, frost each of the brookies with about 2 tbsp of the frosting. Garnish each frosted brookie with 2-3 conversation hearts, if desired. **Store any leftover brookies in an airtight container for up to 3 days. 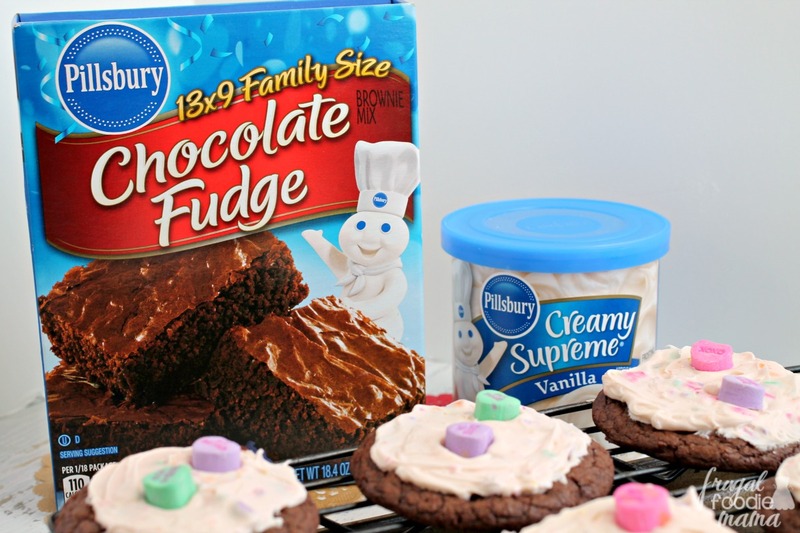 Recipe for the Brownie Cookies courtesy of Pillsbury. I do have a few tips when it comes to the candy conversation heart frosting. The best way to crush these candy hearts is to place them in a gallon or quart sized resealable bag and pound away at them with a meat mallet. 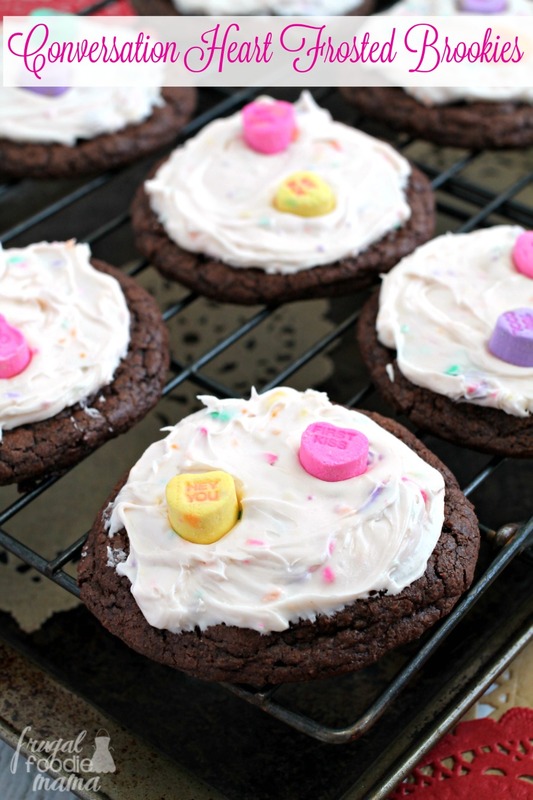 I tried the food processor, but the conversation hearts were too hard for it. 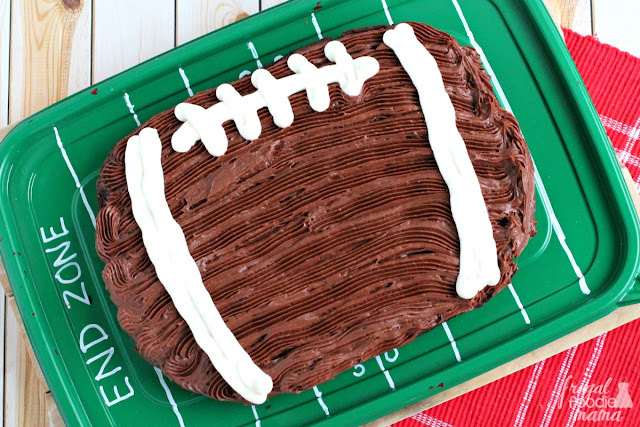 How will you and your family be mixing it up for Valentine's Day this year? Looking for even more ways to Mix It Up for Valentine's Day? Be sure to follow Pillbury's Mix Up A Moment board on Pinterest!